Some of my friends who are new to green and natural living tell me they’re unsure where to start. They say they get stuck trying to decide which changes to make first or which ones are the most important. I definitely understand, because starting to learn about natural living can be overwhelming. But, I always encourage them to start small, take baby steps, make small changes, and just start somewhere. When moving forward on your journey toward greener and more natural living, it’s not so important which changes you make, or which order you make them in, but just that you are making changes. One small change leads to another, leads to another, leads to another – and before you know it, your life will look much different then the lifestyle you’re living today. It’s like the question of how do you eat an elephant? One bite at a time! And there are so many simple and easy changes you can make today! And these changes can make a big difference in your life and have a positive impact on your family and on the world around you! And the best part is, these are easy DIY projects you can do at home in as little as 20 minutes or less! So if you’re ready to get started, here are five simple DIY projects that are easy changes to make and will help you live a greener, more natural and homemade lifestyle! 1. 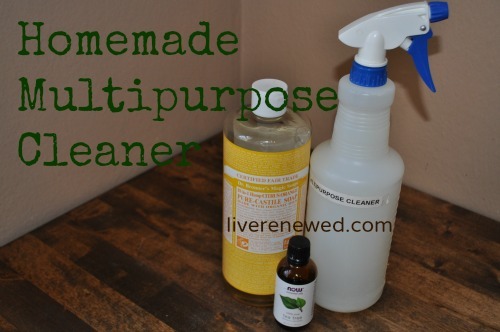 Green and Natural Cleaning: Make a homemade multipurpose cleaner. 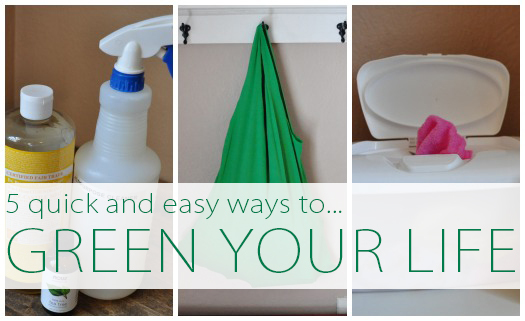 If you haven’t yet made the switch to green and natural cleaners around your home, I want to show you today how easy it can be. Once you’ve made this homemade multipurpose cleaner you will wonder why you waited so long! Fill your spray bottle almost full with water. Add several squirts of soap and about 10 – 15 drops of essential oils – mixing them for best results. Shake to mix together, and shake each time before using to distribute the oils. Use this for cleaning all around your home: your kitchen, bathroom, bedrooms, floors, kids toys, and more. Pretty much anything you need to clean, you can clean with this multipurpose cleaner! 2. Natural Personal Care Products: Make a homemade beauty product. You can make homemade deodorant, sugar scrub, lotion bars, or body lotion. Or check out my Homemade Beauty Pinterest board for even more ideas! Making homemade beauty products can seem hard and overwhelming, but really, most recipes that I have made myself or come across really only take 10-20 minutes. Less then the amount of time it takes to make an average dinner meal. Once you’ve gathered your supplies, I’m sure you can find a small chunk of time to make your own personal care product! Just think how proud you’ll feel after you make something at home that you used to purchase at the store! 3. 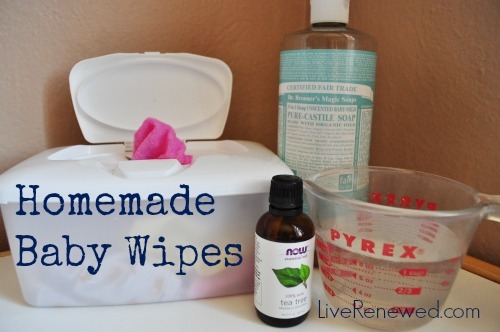 Green Baby & Child Care: Make homemade baby wipes. 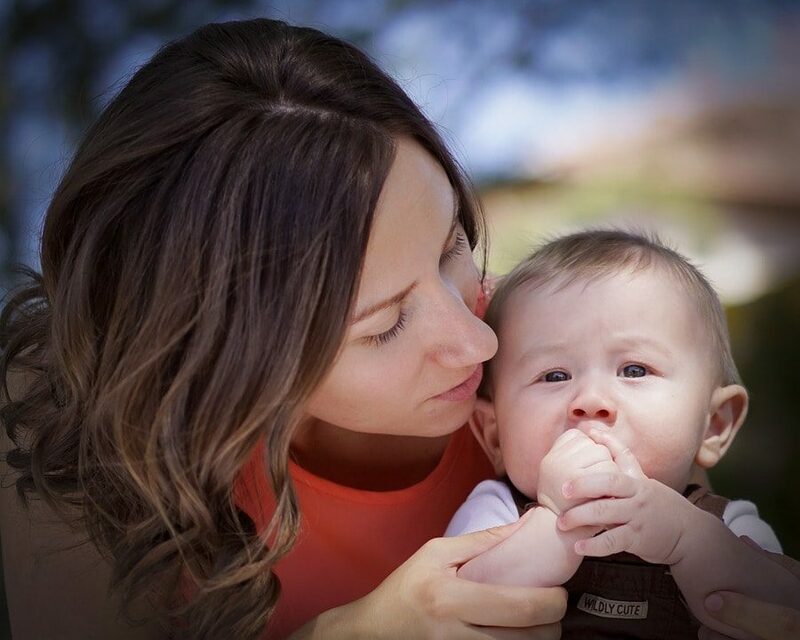 It’s important to get our babies and kids in on our green and natural living changes. Not ready to commit to cloth diapers yet? Make a smaller change to using cloth wipes and once you see how well they work, you won’t want to go back to the disposable ones! Place the washcloths into the baby wipes container, you can fold them nicely or just throw them in there, either way works! Use about a cup of water and add several squirts of castile soap or natural baby wash and around 5-10 drops of essential oils. Mix together with a fork ,and then pour the solution over the washcloths until they are saturated but not completely soaked. These wipes are perfect to use for diaper changes. They make clean up so much easier then disposables wipes that often just smear the mess around more. Or you can add them to your diaper bag or purse to use as wet wipes to wipe messy hands and faces after eating, or even to clean and wipe down surfaces like shopping carts, high chairs, tables and more when you’re away from home. 4. Around the House: Make hankies to use instead of tissues. It’s cold season and that can mean lots of nose blowing, especially if you have young kids at home. (Don’t their noses seem to run constantly this time of year?!) Make reusable hankies for your family to reduce the amount of waste you create, save money, and protect little noses from getting chapped from too much blowing. Take an old t-shirt, flannel receiving blanket, or some other piece of scrap fabric and cut it into squares. Our family’s hankies are between 6″x6″ to 8″x8″. Use a small basket to hold your hankies in a spot where you usually keep your tissue box and encourage your family to use them. Their noses will thank you! 5. In the Marketplace: Make reusable bags out of t-shirts. 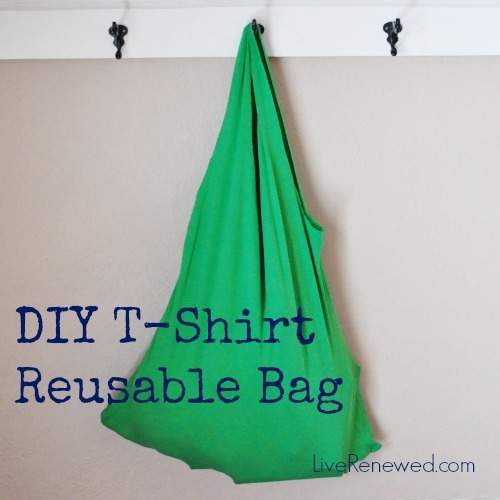 Another way to give new life to something old sitting around your house is to make an unused t-shirt into a reusable shopping bag.This is a super quick and easy sewing project, because if I can do it, you can do it! Turn a knit t-shirt inside out, line up the bottom seams, and sew a straight line across the bottom Turn the t-shirt back right-side out and cut off the arms holes at the seam. Fold the shirt in half and cut the neck hole off to create handles that are even on both sides. Trim the seam and corners if necessary. Turn the bag right-side-out and use it for your next shopping trip! These 5 areas of green and natural living are covered in depth in my new ebook Green Your Life: A Guide to Natural, Eco-Friendly Living. For more tips, ideas, advice and more DIY recipes you’ll want to check out this comprehensive 250+ page guide to help you live a greener and more natural life! If you purchase the Green Your Life ebook through the end of January, you’ll also receive unlimited full access to the Green Your Life Challenge online e-course coming up in February. That’s a 60% discount! If you’re looking for resources to help you along on your green and natural living journey, then Green Your Life is the perfect book for you! Click here to get more information and grab your copy of the book! How do you take baby steps, or make small changes, toward a greener and more natural lifestyle? Next PostAre big families eco-friendly or a carbon footprint nightmare?